Working in the garage can make a lot of people sweat. But if you’re working in the winters, that extra bit of heat might just be necessary. For most households, the garage is a part of the central heating system. But if it is not connected to the heating supply, then it can get cold. Very cold. Best electric garage heaters work in a number of ways to keep your garage warm and cozy. But if you don’t know exactly what to look for, then how are you even going to find the best garage heater? Behold, our top 6 picks for the best and cheap garage heaters will help you out! The Dr. Infrared garage heater is a great addition to your garage to make it more comfortable for working or spending time there. This heater comes with a thermostat control in temperatures ranging from 45 to 95 degrees Fahrenheit to keep you warm even in the chilliest weathers. It is perfect for a standard garage size as it can heat an area of up to 600 square feet without any hassle. It runs on about 220V that makes it perfect for residential usage. The highly portable design allows you to carry it almost anywhere safely. Aside from garages, it suits construction sites, basements, and even workshops. The fan in the system allows the heat to be spread evenly and a continuous flow of warmth. The safety is also intact on this device as when it overheats or runs for a long time, the machine turns off itself for some time so that even if you forget to switch it off, you can be at peace of mind. The machine is listed on UL and CUL mark that makes it safe according to the standards of the United States and Canada. 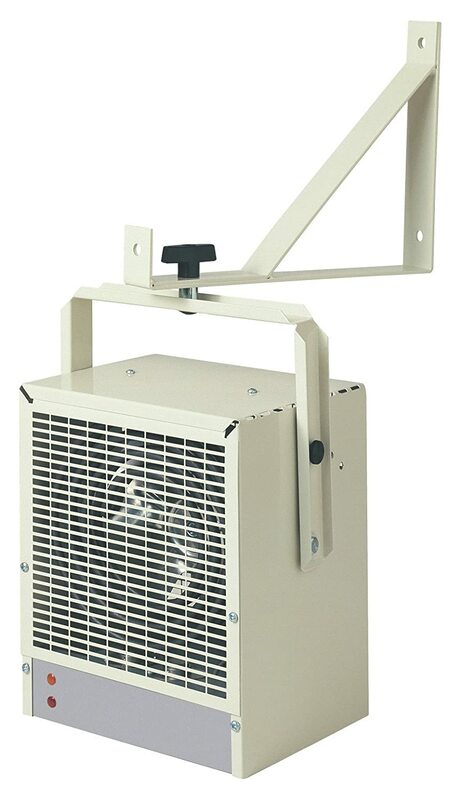 The Fahrenheat garage heater is a rugged and heavy duty garage heater that offers its versatility towards basements, workshops, and other places as well. It is built on an industrial type design that allows it to perform extraordinary wherever you decide to use it. The design is also made portable with a handle so mobility is easy. The machine has a thermostat that allows users to adjust the temperature to their liking from a range of about 45 degrees to 135 degrees Fahrenheit. This means that even if it is freezing outside, you can remain warm and cozy while working in your garage. Aside from being easy to carry, this garage heat is also easy to mount on the wall or the ceiling with the brackets in the body of the heater. The use of flaps allows users to decide where the direction of the heat should be. The design is perfect for your home garage and for various other places. 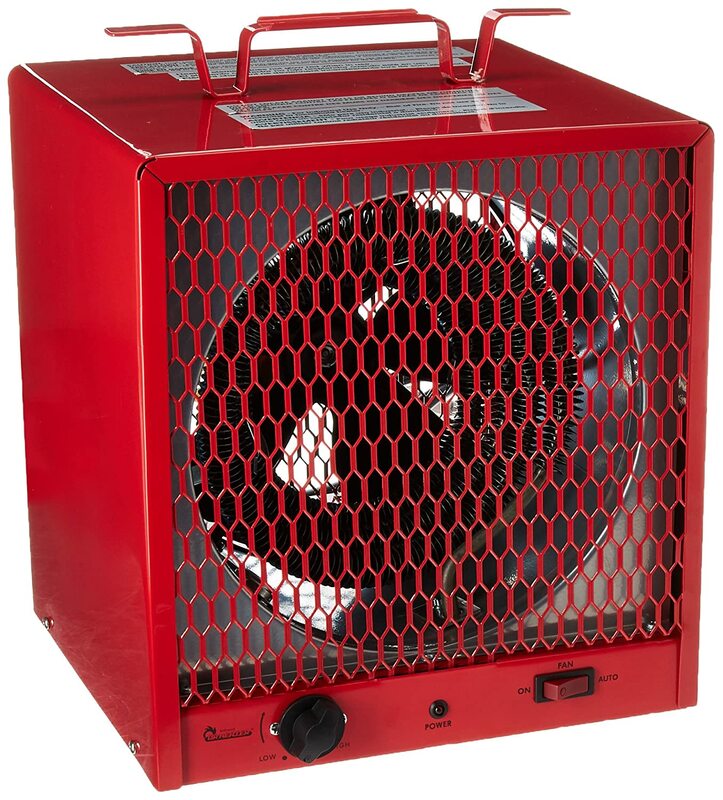 The Dimplex garage heater is a heavy-duty garage heater that works wonders in the garage. The heater gives off about 13640 BTU and ranges from temperatures between 45 to 77 degrees which can be set with the thermostat. There is a fan in the heater responsible for evenly distributing heat. The job of the fan is also to use the residual heat in the system to save up on a lot of energy that the heater is supposed to consume. It takes about 240 volts that is why it is perfect for home and small workshops as well. The heater can be mounted on the wall or the ceilings with the brackets that are included in the system. The heater also has the ability to swivel when mounted so that the heat can be directed to each side individually. The company offers one-year of warranty on the entire unit. 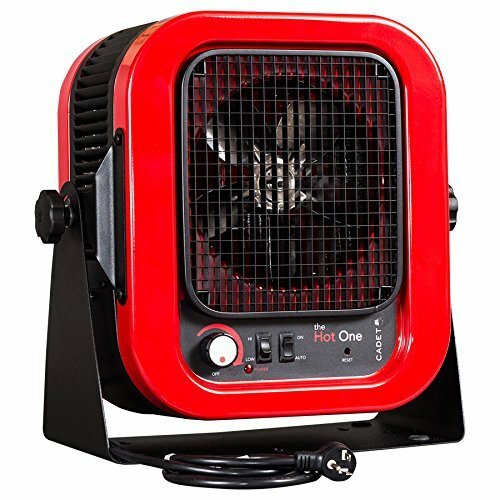 The Cadet space heater is a compact designed heater that holds a lot of features to make it one of the best garage heaters. 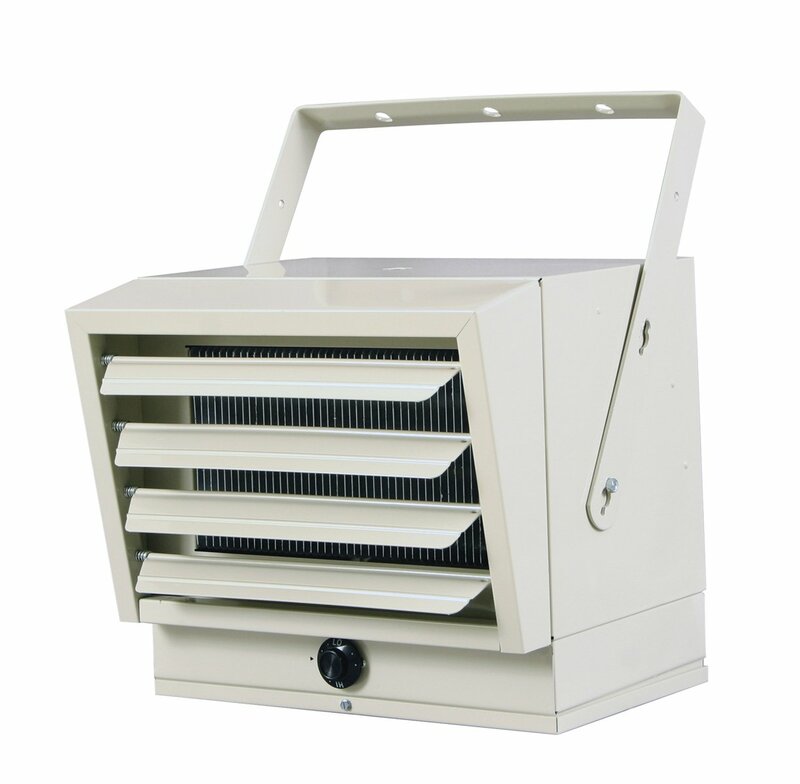 It is specially designed for places that are not well insulated and need a safe heater. There are two settings to this heater which are high and low, that can be set according to user preferences. The heater requires a 240 volts receptor which is usually perfect to achieve for residential usages. There is an also fan only setting which allows the fan of the heater to work without throwing off heat for the sake of ventilation around the area. The heater has a compact design and is also suitable to be mounted on the wall with the given brackets. The heater has a highly stable and flat leg that it can rely on while using it for standing. It comes with a six-foot-long wire and meets all the electric standards of the United States listings. 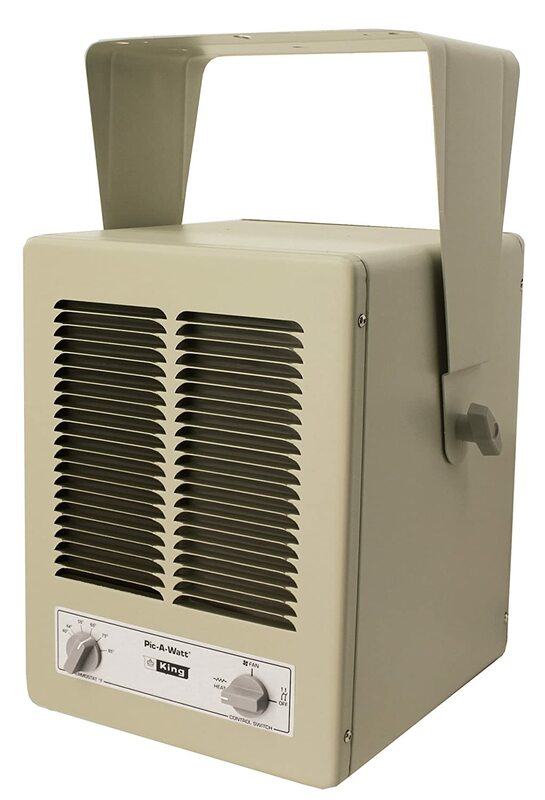 The King heater is a quality garage heater which is safe and a great way to make your garage warm while you work there. It has a compact design that fits anywhere. The design is also made portable with the handle that allows you to carry it anywhere. The system of this heater works by taking in heat from the back and warming it and throwing it out the front. One of the best things about this heater is to select the wattage that it works on. This feature saves energy and makes the system safe to use. It is also used to determine whether you want to heat up a large space or small space. For a safer approach, this heater has an auto shut off which turns the system off automatically in case of any abnormal electric event. There is a three-way thermostat switch which allows users to select the temperature. The machine can easily be mounted on the wall or ceiling with the given brackets. It is also listed on the UL and CUL lists so that it meets most electrical standards. 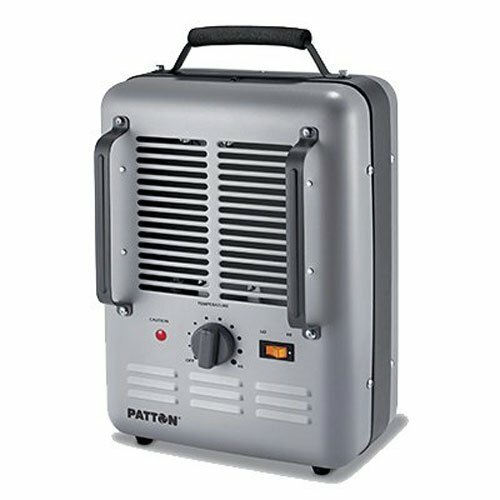 The Patton Utility Heater is a great addition to your garage. When the cold gets out of bearable limit, and every other product has failed to live up to your expectations that’s when you can rely on the Patton Utility Heater to have your back. This garage heater is powered by electricity, and uses a fan-based convection to heat up the entire garage. The product itself is perfect for small or medium garages, workplaces, and penthouses. The heat can be altered by using a thermostatic control, between 1000 and 1500 watts. But the most interesting thing about the Patton Milk-House is that it shuts off automatically if it is dropped or tipped over. This reduces the chances of vent blockage and overheating. It also has a very quiet functioning, and will not disturb you in your work. It has been tested and found to meet UL standards, which ensures that the product is safe. And if you’re looking for portability, then you’ve just found it. The Patton comes with its very own carry handle, which makes picking up and moving about a lot easier. Works in great small to medium basements, utility rooms, workshops, garages, and sheds. Supplies a standard 1500 watts of energy. Comes with a thermostatic control. Tested to comply with UL standards. Automatic shut off if tipped over. Weighs only 5.45 pounds; lightweight. Might be too loud for some users. Requires a lot of maintenance to increase durability. It still stands that you still don’t know what to look for in a good garage heater. After all, it’s only by chance that you’ll get your hands on any one of our top 6 choices. Electric heaters were the first to do the trick. They require nothing more than the electric supply already installed in your house, and work for hours at a time with no apparent shutdowns or breakages. Below is a list of things that must be considered and thought out before finalizing the purchase. Many garage owners find that the heater they bought does not heat the entire garage. A decent heater should cover the entire area of the garage. Most of them usually state exactly how many square feet or inches they can heat up within an hour or so. A larger heating area means more power and thus more energy consumption. You might want to purchase a more powerful one if your garage is extra-large, has large doors and windows, or remains extra chilly during the winters. If you can’t maneuver the heat in your room, then what’s the point of spending so much on a heater? Invest in a garage heater that has multiple options. A heater with a thermostat is a great start. You should be able to control the heat in your garage. Protection from overheating and power shortages is also a plus. If your garage can hold up to two cars, you might want to buy a two car garage heater, specially meant for larger areas and better regulation. Another important aspect to look for in the electric heater is portability. Not all models can be easily moved around. For the most part, all electric garage heaters are portable, but not all. Be sure to check the size, type, and structure of the heater. A model with wheels on it would be the most perfect choice. Usually, a smaller garage heater means a smaller power output. So don’t buy one which is too small. Just go for a moderate size. Added bonus if the heater is lightweight. An electric heater will usually cost a lot more than a gas-powered one, and the power bill will also render your pocket. Keep in mind that extra features mean extra money, and that a cheap price isn’t always good. Some products are cheap for a reason, and it is best to invest in a product that will last longer. Thermostats, customizability, automatic shutdown, overheat protection, and even an indicator light will cost more. So if you’re low on budget, then get ready to settle for a garage heater which just does the job. As a general rule of thumb, keep in mind that 45,000 BTUs is enough to heat a small or medium size garage, specifically a two-car one. However, some cheaper and lower intensity heaters will say that 30,000 should be enough for your garage. The exact number varies, but just be sure to confirm with the seller about this. Larger garages require more BTUs to heat them up. Q: Which fuel type is best for a garage heater? As a personal opinion, we prefer electrically powered garage heaters. The reason being that these heaters consume less power and offer you safety, while they also provide the same efficiency and ease as gas-powered heaters do. Q: Do electric heaters cost more? Why? Electronic components obviously cost a lot more than a simple gas burner. This can make the price range between $40 and $200. Moreover, not only is the initial price heavy, but the power consumption can lend some really long bills in your hands. Usually, more power means more consumption, which eventually leads to power bills and taxes. If you’re interested but don’t have the extra cash, buy one which reduces consumption by up to 40%. Q: How many BTUs to heat a 3 car garage? The exact number is a bit debated. Most believe that around 60,000 BTUs should do the trip for 3 car and larger garages. However, some lower intensity infrared heaters use 50,000 BTUs. Nonetheless, 60,000 BTUs seems optimal for electric and gas heaters. Q: Does the temperature affect the car or its parts? Maintaining the temperature of the garage not only keeps it nice and warm for you, but the right temperature can actually be better for your car. If the temperature is too hot, the car’s tires will be the first to get affected, followed by the battery, the oil, and even the metal chassis. If it’s too cold, condensation can jam car parts, and the battery might be too jarred to work too. Maintaining the correct temperature ensures that your car will be up and running for winter. Q: How many Watts do I need for my garage? The exact power output required by a garage heater varies a lot. Usually, this depends on the size of the garage, including the height of the ceiling. An easier way to envision this is to multiply the square footage of the garage by 10. For example, a garage with a square footage of 586 square feet will require a heater of about 5860 watts to suffice. Similarly, a garage with 144 square feet of the area requires 1440 watts of power. The ceiling is typically not included, as heating there is not required. Q: Is central heating more efficient than space heating? Not always. Many central heating systems have been designed to reduce power output, but this isn’t always the case. Yes, buying individual heaters for every single room in your house will definitely cost more. But the power consumption for central heating units is a lot more. It also depends on your needs. If you want to heat just one room, electric space heaters will work. If you want to heat the entire house, a central unit is your best choice. Q: How much will the power consumption of an electric heater cost? This also depends on location and currency. In a typical household in the US, the wattage of the heater decides the cost. A 1500 watt heater will cost about 16 cents per hour. Similarly, a 5280-watt heater costs about 56.32 cents per hour, or roughly half a dollar. As a basic guide, remember that a single Kilowatt (1000 watts) costs about 10.6 cents. Q: How long should I use a heater before buying a new one? The average shelf life of a garage heater usually ranges within a period of 15 or 16 years. The life of the heater is significantly reduced if there are no maintenances or cleanups every now and then. Dust and grime can render a heater useless, so remember to clean out your garage heater every now and then. If you feel like your heater has stopped working properly before 15 years, then feel to free to make a warranty claim or buy a new one from our top 6 picks. While many of us use central heating, the garage is usually not included. And for that, a nice little garage heater can do the trick. A good garage heater uses lesser power and provides more output than input. More power equals better coverage, but also bigger expenses. So just be sure to buy one that makes you feel confident and responsible! And as for our top 6 choices, we love all six of them. We really hate to compare great products to each other. Finally, the choice needs to be made by you!